Republic Day means different things to different people. For children and families it means holidays while for the armed forces that day its a chance to showcase their strength while the valour of the chosen few from the armed forces is recognised and rewarded by way of bravery awards. Lucky are those who can personally receive the medal otherwise its their family members who receive it and the audience and spectators are told about their feats of utmost courage and sacrifice against all odds. " Heroes" series presents to you the list of all such medals and their importance. The information has been compiled from the net and is meant to serve as a quick reckoner only. 1. Param Vir Chakra (PVC) is India's highest military decoration awarded for the highest degree of valour or self-sacrifice in the presence of the enemy whether on land, at sea, or in the air. 2. Maha Vir Chakra (MVC) is the second highest military decoration in India after the Param Vir Chakra and is awarded for acts of conspicuous gallantry in the presence of the enemy, whether on land, at sea or in the air. 3. 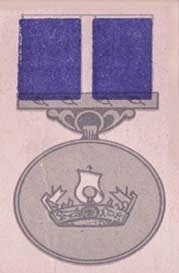 Vir Chakra ( Vr. C.) is presented for acts of gallantry in the presence of the enemy, whether on land or at sea or in the air. 1. Ashoka Chakra ( AC) - is India's highest peacetime military decoration awarded for valor, courageous action or self-sacrifice away from the battlefield. It is the peace time equivalent of the Param Vir Chakra, and is awarded for the "most conspicuous bravery or some daring or pre-eminent valour or self-sacrifice" other than in the face of the enemy. 2. Kirti Chakra (KC) is awarded or valour, courageous action or self-sacrifice away from the field of battle. It may be awarded to civilians as well as military personnel, including posthumous awards. It is the peacetime equivalent of the Maha Vir Chakra. 3. Shaurya Chakra (SC) is an Indian military decoration awarded for valour, courageous action or self-sacrifice while not engaged in direct action with the enemy. It may be awarded to civilians as well as military personnel. It is the peacetime equivalent of the Vir Chakra. 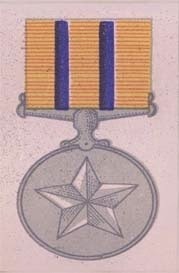 It is generally awarded for Counter-Insurgency operations and actions against the enemy during peace-time. 1. 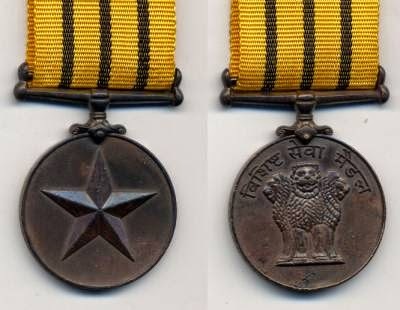 The Sena Medal ( SM) is awarded to members of the Indian army, of all ranks, "for such individual acts of exceptional devotion to duty or courage as have special significance for the Army." It can be awarded for gallantry or it can also be for distinguished service carried out by any soldier, not in the face of the enemy. 2. Nausena Medal is awarded for such individual acts of exceptional devotion to duty or courage as have special significance for the Navy. 3. The Vayusena Medal is usually awarded in peacetime for a job well done. However it has been granted during times of conflict for acts of gallantry in the face of enemy, though not in the same numbers as the Vir Chakra. Awarded for such individual acts of exceptional devotion to duty or courage as have special significance for the Air Force. 1. 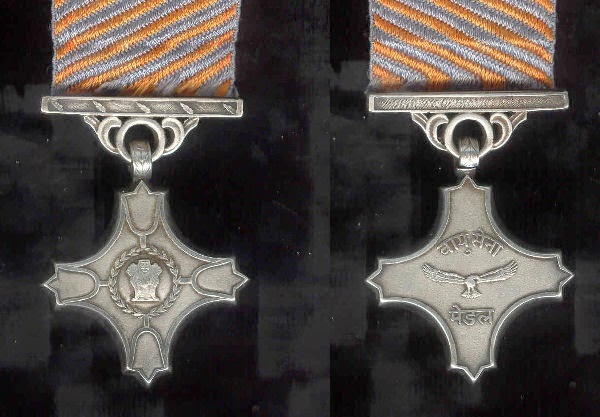 Sarvottam Yudh Seva Medal is India's highest Wartime Distinguished Service decoration. 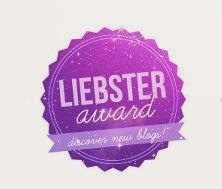 It is awarded for the highest degree of distinguished services in an operational context. "Operation context" include times of war, conflict, or hostilities. 2. 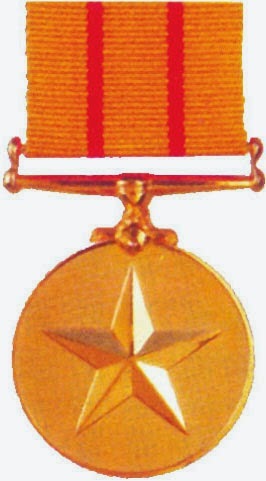 Uttam Yudh Seva Medal (UYSM) is awarded for a high degree of distinguished services in an operational context. 3. Yudh Seva Medal is awarded for a high degree of distinguished services in an operational context. 1. 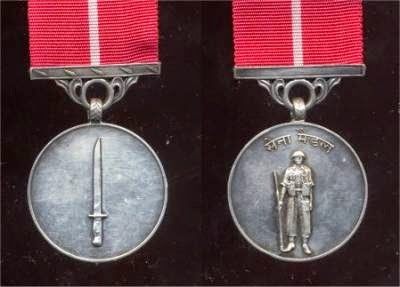 Param Vishisht Seva Medal (PVSM) is a military award and is awarded in recognition to peace-time service of the most exceptional order. 2. 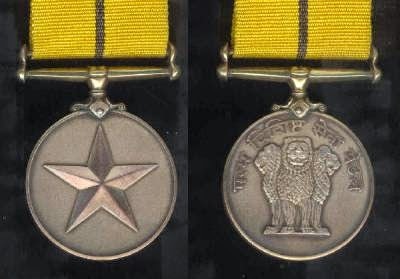 Ati Vishisht Seva Medal (AVSM) is given to recognize "distinguished service of an exceptional order" to all ranks of the armed forces. 3. Vishisht Seva Medal (VSM) is awarded to recognize "distinguished service of an exceptional order" to all ranks of the Indian armed forces.